In July of 1947, B.A. Dario traded up his half miler in Pascoag, for his new four million dollar facility in nearby Lincoln. Equipped with 8,500 grandstand seats he got from the closed Agawam Track in Massachusetts, he wedge himself right into the New England racing world, going head to head with Suffolk Downs. Luckily it was 1947, racing was the only game in town and he pulled it off. Lincoln at the time was the Aqueduct of Rhode Island while Narragansett was the Belmont, until the later descended the ladder in it latter days, with each ending as equals. It wasn't that there wasn't any class racing at Lincoln, till 1954 there was the Rhode Island Special, which had a $50,000 purse back then. Through the sixty's there still was a little stakes racing, but at the end it was pretty much a string of 1,500 claimers. 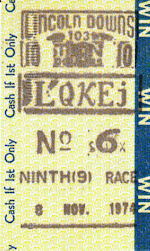 On Friday night, April 16, 1971 Lincoln Downs literally did a change of pace. In the evening opener driver, Henry Fillion guided Tresco from the eight hole, to be the first standardbred ever to cross the finish line in a pari-mutual race at Lincoln. It had been over thirty years since commercial harness racing was held in Rhode Island. The last meet was at Narragansett Park. 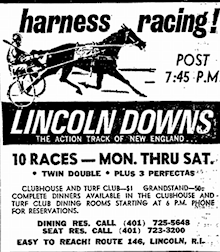 Like the meet at Pawtucket oval, harness racing lasted only one season at Lincoln Downs. 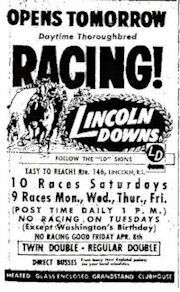 As for my personal memories of Lincoln Downs, I don't really recall the first time I went there. It probably was the mid-sixty's. I used to like the morning Thanksgiving card, it just seemed right not having to wait around, just get up and go. There were also a couple of things that I remember that stuck in my mind. One was on a cold winter racing day, the post parade was abbreviated, but there was a short one. The one horse was Captains Decision, his rider Ray Pasquarelli, both veterans of the fair circuit, both in the twilight of their careers. Instead of warming up they both just sat motionless in front of the starting gate, eventually they loaded the gate, and whether it was that conserved energy or not they both roared down the stretch to get up by a nose. Another race involved fan favorite Tommy Maeda. I had bet him on a horse named the Redeemer. Entering the short Lincoln Stretch, they were about six in front and I was counting my money. All of a sudden The Redeemer bolts for the outside fence, threatening to jump the rail and get himself a beer. Give Maeda credit for a great ride, he didn't pull him up or jump off, he just kept whipping. Maeda and The Redeemer weren't in the replay, but they were in the photo, prevailing by a nose. The last memory I recall wasn't a race. I used to sit in the grandstand and enjoy the scenery across the track, which included a Rhode Island State Police Barracks. On this particular day in the first race, a maiden event there was a shipper from Turf Paradise. Turf Paradise! that should have been a red flag right there. The horse had one line in his charts every call was an 11 in an eleven horse field, he was badly outrun. In the program he was 20-1 which seemed logical. With about eight minutes to post that started to change, he was down to 15, then 10, every flash he was dropping like a rock till post when he was the 8-5 favorite, I had never seen anything like this, took every penny I had and ran for the windows. The gate opens, the horse was on the outside, it looked like he got shot out a cannon and won by at least 20. Well not everybody viewed this as a gift, with Lincoln having a questionable reputation and all, soon after the race there was a loud bang as one of the large panes of glass from the grandstand widow went crashing to the ground, somebody was upset. It took a minute or two but all of a sudden the State Police Barracks looked like a keystone cop movie as cruiser after cruiser lights flashing were tearing out for the track. I don't know if anyone got caught, just another day at the track. Speaking of crime there is one other thing I remember, that parking lot, what a mess. It was a crime you had to pay to use it.